This new look system replaced the Beosystem 3000. The main difference was that now a Datalinked compact disc player was offered as part of the system. 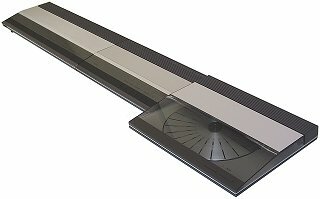 Beogram CD 3300 was very similar to the original Beogram CD X that could be used with Beosystem 2000/3000. The other important difference was that the Beolink 1000 terminal was used for remote control, and could also control Beovision televisions, Beocord video recorders and LC 1 light control, making the Beosystem 3300 integrate better with the rest of the range. The touch control panels were now light grey as opposed to black. Loudspeaker choice remained much the same as before, but was now broadened by the addition of Beovox RL 35. Text copyright © Beocentral. Unauthorised reproduction prohibited.